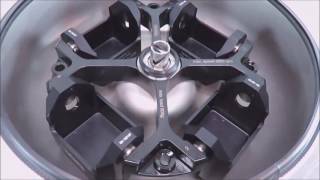 The Sorvall BIOShield 4 x 250 mL Swinging Bucket Rotor is constructed of stainless steel body with aluminum buckets and is built for use with large capacity centrifuges such as the Sorvall RC 4 series, and the Haraeus Cryofuge 5500i. This BioShield Series Swinging Bucket Rotor has a capacity of 4 x 250 mL per run, achieving a 90° angle. The Thermo Scientific Sorvall 75006435 Swinging Bucket Rotor has a max speed of 5850 RPM, a max RCF of 6963 xg. This swinging bucket centrifuge rotor is also biocontainment certified, with an included sealing lid. This Sorvall BIOShield 4 x 250 mL Swinging Bucket Rotor has been tested for balance and performed as expected. All of our lab equipment comes backed with our standard warranty. Should you have any questions please don't hesitate to contact us.